I recently spent three weeks on the conference circuit reconnecting with old colleagues, making new friends and meeting potential business partners. All this networking got me thinking about “my squad” — the people in my life on whom I rely both personally and professionally for support and advice. To borrow from Jim Rohn, “You are the average of the five people you spend the most time with.” Squad members can change over time, especially if you move on to new industries or roles, but it’s important to have the following people around if you want to maximize your growth and impact on your chosen career in real estate — or any other industry. Mentors: A mentor is usually someone who has been in the business longer than you and who you can turn to for objective professional advice. Whether it’s calling/emailing them to ask a quick question or a more detailed involved discussion about strategy, you absolutely must have at least one. Seeking out and finding a mentor can sometimes be challenging, and often the best ones turn out to be ex-bosses or teachers. The key is to find people in your industry who can give you unbiased coaching and support. You can also have multiple mentors to help with different areas of your life. For example, in addition to my role at ReferralExchange, I also lead a nonprofit that gives away free prom dresses and accessories to northern California teens. I have mentors who help me in both of these areas. Professional Peers: Unlike mentors, these are people/colleagues who are at a similar place in their careers as you are. Use these folks to trade advice, brainstorm, socialize and network with. You can find peers at your current and former companies, or groups/organizations. Your peers are probably the most fluid of your squad members as you shift to a new job or industry — but they are the folks with whom you will interact most frequently. Trusted Advisors: Trusted advisors are different from mentors or peers because they have a specific skill or talent that you rely on and are often paid members of your inner circle. They can be your tech guru, PR team, strategist, etc. — subject matter experts who help you and your company be successful. Future Members: You should always be on the lookout for new members of your squad. As people cycle in and out of careers and companies, you need a squad that adapts and grows as you do. Your current members can be your best resource for new additions, but be open to meeting new people with different points of views. Unequivocal Cheerleaders: Sometimes you just need a pep talk, sound advice or a shoulder to lean on. Your cheerleaders are the core of your squad — those people you can turn to when times are tough or when you want to celebrate major accomplishments. No matter what, they have your back. Former Squad Members: The reality is that people change and sometimes grow apart. Just as you may need to let someone go from your business, you may need to do the same for your squad. They are your support group, but if you’re not getting support, it’s important to bring in someone new. While you might already have many of your squad members in your life, don’t wait for new ones to come to you. It’s important to network and put yourself out there. Offer to speak, help out at industry-related events or host a “meet and greet” lunch where every invitee brings someone the other attendees don’t know. If you’re attending a conference, find out who else is speaking/ attending and send them a meeting request in advance to connect. Try to identify different events or activities to attend where you’ll meet new people beyond your usual crowd. Sometimes the best thing you can do is take a step outside your industry. And finally, when you are at an event, force yourself to sit next to someone you don’t know and introduce yourself to at least one new person per event. Almost everyone attending that event knows they need to do so as well, and they might even be relieved if you make the first move! Once you find your squad, don’t forget to nurture it. Keeping in touch and saying “thank you” periodically can go a long way. Consider paying it forward as well by mentoring the next generation of up-and-comers at your work or in your industry, or become a squad member for another friend or colleague. Doing so will not only supercharge your career — it will make your life richer and more impactful as well. Wondering Where We’re Headed Next? 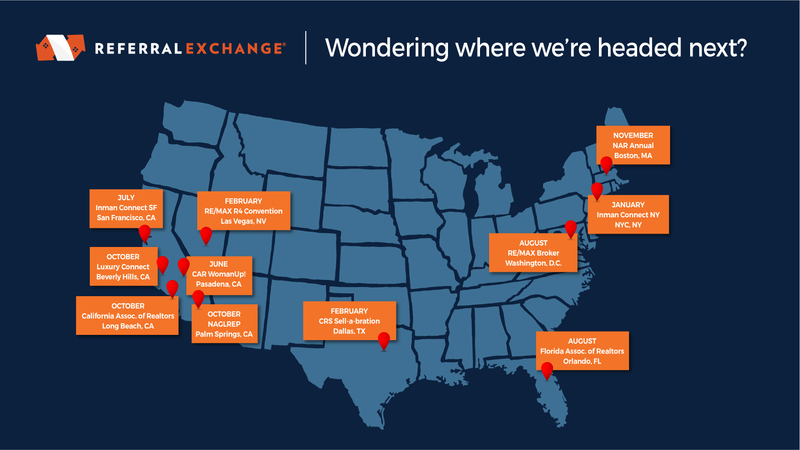 We really enjoy traveling to different industry events across the country. It gives us a chance to meet new people, see old friends and connect with the amazing agents in our network – and 2018 is shaping up to be a great year. If you’re attending any of these conferences, drop us a line at marketing@referralexchange.com. We’d love to connect! August: RE/MAX Broker – Washington, D.C.
Several months ago, I realized that I was living my life in a faded beauty shot. Everything I looked at had a warm glow around it, and everything was slightly blurry. Bright sunlight washed everything out and, at night, everything was just black. Long story short, I had a rare kind of cataracts, but because of the type of contacts I’d worn for 30 years, I had to wait a minimum of three months to have them fixed. The reality is, at one point or another, it’s inevitable that we will experience an event that makes everyday life and work more difficult. As I reflect back on the experience of living life with marginal vision, there are some valuable lessons from the experience that I think we can all apply to our life and work. Asking for help is a good thing. We live in a world where being independent is an asset, and many of us feel guilty if we need support. I had to ask for help much more frequently. Whether it was having my coworkers do all of the product demos during NAR, or needing my marketing manager to help design a presentation — asking for help was hard. But I realized that my friends, colleagues, and family members loved helping; it made them feel good and appreciated. Don’t be afraid to hire experts. Furthermore, technology has made it very easy for us to run our businesses and our lives, and we often feel inadequate if we can’t figure out how to do something successfully. You don’t have to be able to do everything. That’s what experts are for, and it’s often money well spent. I couldn’t create our holiday video on my own this year, so I had our designer do it. The results were much better than I could have done — even if I had been able to see properly. Listening intently is key to a successful interaction. Since it was hard for me to see visual cues or presentations, I had to listen much harder during a conversation or meeting. I found myself speaking less and listening more to ensure I truly understood what was going on. This hyper-focus helped me identify issues and concerns I probably would have missed had I been simply watching a presentation. It pays to slow down. Everything takes longer when you can’t see well. I had to plan much further in advance. Extra time was needed to be built into every project since I needed “extra eyes” — and I had to be incredibly prepared for any presentations I gave or panels I moderated because I couldn’t read my notes or see a teleprompter. Being proactive vs. reactive helped projects run much more smoothly and yielded better results. Definitely a lesson to apply in all of my work. Be truly grateful. I just recently had my first surgery, and even with one bad eye, my eyesight is better than it’s ever been, which is amazing. I’m truly grateful to live in a time when technology and medical advances make it possible for me to have my vision restored with a 30-minute operation. And while I noticed how dirty my kitchen was after the surgery, it was wonderful to be able to “see” my family and friends again – and to read a computer screen without a 175% magnification. Time passes. When the doctor told me that I’d have to wait several months to get the surgery, it seemed like forever. How would I get through conference season or be productive at work for that long? I took it day-by-day and week-by-week, and told myself that eventually my hazy world would be a distant memory. No matter what we do, we’re going to experience challenges in our life and career. The important thing to remember is, sometimes you have to adapt and lean on your “squad” — and that’s a good thing. I’m almost at the end of my journey — time did pass and I did survive — and I’m a better person, manager, and colleague for my experience. It’s officially 2018, which means you are busier than ever — chasing new goals, catching up from the holidays, and trying not to break that workout resolution you made. There’s only one you and only so many hours in a day, so here are a few ways you can save your precious time this year. In addition, hiring a VA is more affordable than adding actual “live” head count since you don’t need to pay for office space, training, or a salary that a full- or part-time employee requires. Start by checking out virtual assistant websites such as Upwork and Zirtual. Use a freelance writer, designer, or videographer. If 2018 is the year you’re finally going to start a blog or step up your social media game, hiring a freelance writer or designer could make all the difference. Freelance writers can draft content for your blog, social media posts, listings, and marketing materials. If you’re not a design or video pro, a freelance designer and videographer can help design graphics for social media/marketing materials, and create videos for your listings or client testimonials. Freelancers as opposed to full-time employees are more affordable, have more flexibility, greater experience with different jobs, and work independently. Automate your content and follow-up. Gone are the days of waiting until a specific time of the day to send out a tweet or email. If you’re not doing so already, a few things you can automate include managing/scheduling social media posts (check out Buffer and SproutSocial), newsletters/email drip campaigns (we use MailChimp), lead follow-up via text and live chat customer service on your website. Check out a full list in this Inman article. Start by evaluating which of these activities you spend the most time on and start from there. Pro tip: have your virtual assistant schedule it all. You obviously don’t have to automate everything, but setting up and scheduling a few things in advance on a weekly or monthly basis can free up a lot of your time. Learn to say no. If you are a newer agent, this may be harder to do, but once you have a steady flow of business, you need to learn when to say no to a new listing or buyer. If it doesn’t feel right, or the client is out of your wheel house of business, consider referring them to an agent who specializes in what they need and has the time. It’s a win-win because you’re still able to assist the client, collect a referral fee and focus your time on other things — and sometimes saying “no” gives you the chance to say “yes” to something bigger and better. Real estate brokers face new challenges every day in their efforts to remain relevant to agents and clients. Relevance was easier to accomplish when it was harder for consumers and agents to access information and manage the process of home-buying and selling on their own. Back then, brokers were the face of real estate in their community, handling the local advertising and marketing, as well as running and managing the office. Today, everything has changed. Consumers and agents control the flow of business, and it’s easy for individual agents to manage their own marketing and business. Consumers have access to view and select properties and can even make offers independently online. Since brokers no longer “own” the agent-client relationship, they need to find other ways to continuously add value. Otherwise, they will find it difficult — if not impossible — to retain and recruit new agents. • Splits/fees: The agent’s split is too low and the fees charged by the brokerage are too high. • Technology: The brokerage’s available technology is out-of-date or difficult to use. • Mentoring/training: Agents don’t feel that they are receiving sufficient mentoring and training. • Brand/culture: Many agents now have their own personal brand, and the brokerage brand or culture might not be in sync with theirs. Being part of a referral network and making it easier for agents to work with more referrals can help brokers set themselves apart from the competition — and bring itself to equal status if it’s a local, boutique brokerage without nationwide coverage. Top agents use referrals every day to help them support past clients or leads outside of their preferred price point, property type or area, so this is a key benefit to offer. 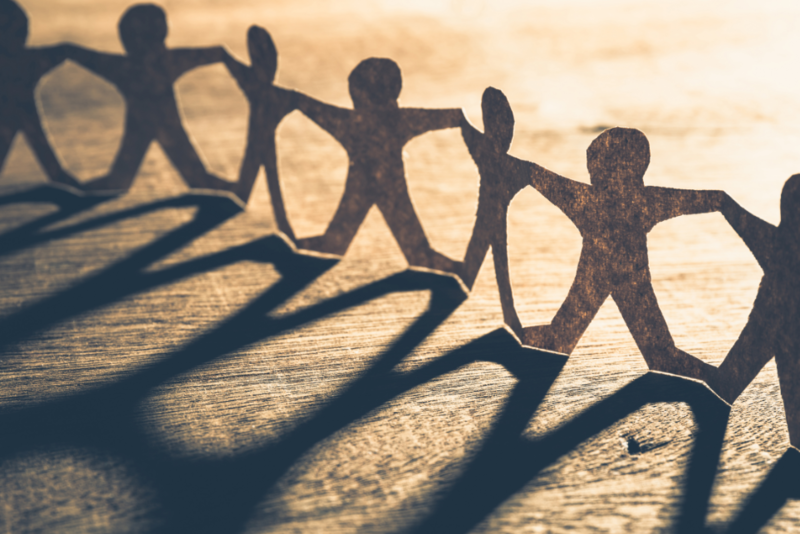 Because referral networks come in a variety of shapes and sizes, it’s important to find the one that best fits the needs of you and your agents. If you’re part of a nationwide brokerage, it likely has referral/relocation solutions already in place for you and your agents to use. Many of the leading coaching programs make it easy to connect with fellow “coaching members.” Other National Association of REALTORS affiliations have strong, built-in referral and education networks — The Residential Real Estate Council (formerly CRS) is one of the largest with over 31,000 agents worldwide. There are also specialty networks, such as Leading Real Estate Companies of the World, which seek out one or two brokerages per market, or Giveback Homes, which connects agents interested in community-giving. Finally, there are organizations like ours which handle the referral process on a broker’s behalf. Your agents might be surprised by how many referral opportunities they’re missing out on if they’re not growing this area of business — reaching out to friends or family members in other cities or states, getting active in their communities or sponsoring local events can all yield increased business. Consider developing a training program surrounding how to generate more referrals or implement a “Referral Challenge” in your office to encourage your agents to conduct 50% more referral business in the coming year. You can even hold weekly brainstorming sessions with your agents to come up with new ideas. Our firm conducts an annual survey (download required) of top performing referral agents and found that referral business can represent over 60% of an agent’s business — 50% from inbound referrals and 12.5% from outbound referrals. The typical preferred referral fee is 25%, and the most important factor to an agent when doing a referral is to ensure that their client is taken good care of. Are your agents doing a similar amount of referral business? If not, there’s room for them to grow. Increased referral business generates increased value for brokers by increasing overall agent success. It can also help counter the reasons why some agents leave brokerages. Joining a referral network is a win-win situation for everyone involved — enhancing your brokerage value and keeping your agents successful, happy and engaged. Now that Thanksgiving is over, we’ve officially entered the chaotic weeks leading up to the holidays – oh, and the end of 2017. As we reflect on what we’re thankful for (i.e., our talented team, hardworking agents, incredible partners) and continue planning for next year, we’ve put together a few things you can do in the coming weeks to make 2018 even better than 2017. Acknowledge who helped make 2017 a great year. This sounds simple, but who made this past year memorable for you? Perhaps it was your team, clients, family, friends, vendors, or referral sources. Make a list of these people and give yourself a budget for how much you’d like to spend on a gift for them. A little thoughtfulness goes a long way, so keep in mind their interests or hobbies when shopping for them, and don’t forget that handwritten thank you note – those will never go out of style. Take the Referral Challenge. As you assess your overall performance, take a close look at how many referrals you did this past year – now increase that number by 50% for 2018. Look at where most of your referrals came from. If it was past clients, it may be time to invest in other referral sources too (e.g., social media, email marketing, online advertising, referral networks). Download our Referral Report for a deep dive into referrals, their value and methods for successful referrals. And use our Referral Planner to help you prepare for next year. Map out your year. We don’t just mean hypothetically “mapping out and planning your year,” – we mean creating a list or map of where you will physically be traveling in the New Year – for conferences, association events, client engagements, etc. Each year we create a Conference Map of where we’ll be traveling. This not only keeps us organized, but also helps us connect with our agents who live in those cities or may be attending those same events. Inman recently published a great list of 2018 events. Think about whether it’s worth bringing some of your team members with you this time. Our first event of the year will be Inman Connect New York in January – will we see you there? Compare 2017 to 2016. 2016 may feel like a decade ago, but comparing this past years’ activities and achievements to it is one of the best ways to measure your performance. You did after all create your plan for the year back in 2016. If there were any goals or milestones, you did not achieve this past year, prioritize them at the top of your list for 2018. Reconnect with your community. The holidays are a great time to pause, volunteer and give back as things slow down. Consider volunteering at a soup kitchen, dog shelter or host a party for your neighbors and clients. Ask that everyone bring canned goods, toys or winter coats to collect and donate. When you get out and active in your community, the possibilities of who you might meet or help (with a real estate need or otherwise) are endless. During Luxury Connect, our VP of Marketing, Lisa Fettner had an opportunity to chat with a group of seasoned Luxury Agents about how they manage their referral business. The agents, all from different luxury markets such as Cabo, Aspen, Hawaii and SoCal, all agreed that staying in touch with their clients, fellow agents and communities were keys to their success in generating incremental business. Remember to ask for ALL of your clients’ business. If they have multiple properties (or are in the market for another), offer to find them an agent where they’re interested in buying or planning to sell. Are they planning to purchase property for staff or a child going to college? Let them know you can help find agents for those purchases as well. Be an information resource to your agents and clients that contains area information and highlights. Send separate newsletters to position yourself as an area expert to keep you top of mind with your agent network and past clients. Be active on social media and post fun facts about your community. Be sure to include photos of your community and area to give prospects and other agents a “true” view of what it’s like to live there. ALWAYS pick up the phone and respond when an agent calls. You never know what a fellow agent is looking for. Perhaps they have a client who needs an agent, or they simply need information on your area. Forging strong relationships and partnerships will pay off in the long run. When you do receive a referral from another agent, be sure to get detailed information about the client and the properties they are interested in buying or selling. Do they want a “shark” to negotiate the best possible deal or are they seeking an advisor who can “hand hold” them through the entire process? Make sure you know the prospective clients timeline as well. Consider sponsoring, hosting or participating in local events. Be the “go to” source for your local paper and broadcast stations. Write a weekly real estate column or host a TV/radio show. Our VP of Marketing, Lisa Fettner, recently returned from speaking at the Xplode Conference in Oklahoma City where she shared tips and ideas for boosting your referral business in the New Year. If 2018 is the year you want to increase your referral business and make the most of your network, keep reading — and take the Referral Challenge. Think “any” and “every.” ANY contact, conversation, or connection can be a referral opportunity, so it’s important to always wear your name tag or branded apparel EVERYWHERE. When you are recognizable as a real estate agent during your daily routines, the possibilities of who you might meet are endless. Have some conversation-starters ready in advance. Use your expanded sphere. Posting on social media (e.g., Facebook, Instagram, LinkedIn) to keep in touch with your friends and family is great, but what about your sister’s husband’s cousin’s brother? Their friends and family should know what you do so you can be their “go-to” real estate resource as well. Think of different ways to reach this extended sphere. Examples include sending out an email about creating a family tree (be sure to send it out from your real estate email address), or sponsoring a family reunion event. Make it relevant. All of your marketing/communications and lead gen efforts should be relevant and personalized. If there’s a new single-family home for sale near a great high school or a new neighborhood park, send that information to the families in your network vs. a young single person. Simply put, people value information and resources that are relevant and tailored to them. Be prepared for not-so-chance encounters. Not-so-chance encounters can happen anywhere — a neighbor’s picnic, in line at the grocery store, during a flight, the hair salon, etc. When you meet someone new, you can often pick up on their interests and lifestyle. If it comes up that they may need a real estate agent, don’t shy away from offering to help — even if it’s simply sending them a market report or adding them to your monthly newsletter. Connect with your local contacts and vendors. Everyone has their “go-to” electrician, plumber, painter, etc. These are vendors that you trust and have worked with for years. Also, partner with your local professional contacts such as doctors, dentists, etc., or personal contacts such as hair stylists or drycleaners. Having a list of reliable businesses and preferred vendors you can recommend to your clients is invaluable, especially clients who are new to your area. It’s a win-win-win because you get a happy client, maintain your reputation, and send business to these local vendors. You have to give to get. As mentioned above, referring clients to vendors who you trust, and know will take care of them, is key. An added bonus — sending referrals to these businesses will help you stay top-of-mind and prompt them to send referrals back your way. Create a flyer of local vendors to hand out at Open Houses, use in listing presentations, or send to your clients. Network with your organizations, association, and groups. This may include your book club, alumni association, health club, homeowner’s association — the list goes on. Each person from these groups or association should know you’re the local expert in your area. Host a seminar for these groups or offer to write an article in their local newsletter. People like people like themselves. It’s true — people like working and spending time with people with whom they share similarities. Make sure when you are posting about yourself, you are sharing your real, authentic self. Don’t be afraid to share that you are an avid hiker, love your two corgis, or enjoy taking cooking classes. It shows you’re relatable and will help others connect and engage with you. It doesn’t have to be all business all of the time. If you have a client or prospect who you know likes to cycle, invite them to a Soul Cycle class with you. A little thoughtfulness goes a long way. Be the relo resource for corporate relocation/partnerships. Many companies or organizations (e.g., military base, small colleges, regional retailers) don’t have an “official” relocation department. Get in touch with their HR department to offer your services. You can be the relocation resource for everyone and these companies can offer an added benefit to their members and employees. Consider holding “office hours” at the company so you can be available to help as needed, and hold Lunch-and-Learn seminars for first-time and move-up buyers. Always be advertising/marketing. As an agent you should always be marketing yourself, and in today’s world there are a ton of ways you can do so. Consider Facebook, web advertising, quarterly mailings, local radio, and just sold/listed postcards as all opportunities to showcase your knowledge and experience in the market. Lead gen can be a referral opportunity. Your marketing and advertising will likely generate a wide variety of leads — and some may be out of your price point, property or location. If you don’t wish to work a lead, consider referring the client out to another agent so you can still earn a 25% referral fee. Managing your digital landscape has become a necessity to succeed in the real estate industry today. Amy Chorew, technology trend expert, author, speaker, and VP of Learning at BHG Real Estate recently joined us to share how to focus your online presence and marketing efforts. During the webinar, Amy shared how to track your digital presence, showcase yourself and your brand, and determine which channels and platforms are best for you. The digital marketing landscape includes awareness (video, social, network display), consideration (targeted display, SEM, lead providers), action (retargeting, reputation, CRM) and retention (retargeting, email). Step 1: Define your market by knowing your market. To define your market, you must first determine the market geography of where you help clients buy and sell. Draw this on a map and list your zip codes — doing so will help you target your online marketing. Next, refine and narrow down the zip codes on which you really focus. Understand your market by assessing market demographics, economics and home sales. You can get this information from your MLS or BrokerMetrics. Start looking at this information monthly so you can identify trends to share with your clients and find new areas on which you can focus your marketing strategies. Being able to review your geography, area home prices, and average income all together will influence your business plan. Step 2: Find your clients (and know how they are finding you). It’s just as important to know how to find your clients as it is to know how they are finding YOU. Start by looking at your company website, your branded website and your CRM. Request the list of referring traffic sources for the past three-month period so you can review the website analytics and identify which websites and social channels your traffic is coming from — these are sites you should put money towards. In addition, create a report from your CRM to quantify the top lead sources for a three-to-six-month period. That will tell you where the majority of your leads are coming from — for example, your brokerage’s lead gen efforts or external sites like Realtor.com, Zillow.com, etc. Off-Site SEO: These include links to your website such as social profiles, 3rd party profiles, reviews, and citations. On-Site SEO: This includes text, rich media, links, and regular updates. Reviews, Reviews, Reviews. Based on your website and CRM analytics, identify which real estate websites are the most visible to your target audience. Amy shared that “85% of online real estate shoppers evaluate/select agents based on reviews. Additionally, “Consumers are 2x as likely to select agents with 10+ high rated (top 2 rating positions) reviews.” Reviews are more important now than ever, as we live in a world where we use reviews to help choose restaurants, hotels, real estate agents, etc. Google and Yelp are important locations to place reviews as well. Having a strong presence on G+ and Yelp improves rankings in search engine results and, second, Google displays ratings on agent searches (this also applies to Zillow, Trulia, and some brand sites). You don’t have to go overboard with reviews Amy notes — try to get a least five to ten reviews on these sites. When creating your profiles on these sites, make sure they are written entirely in your own words, and be consistent. Include your company name, industry focus, and market areas. Keep them between 600-1200 characters. Sites where you can garner client reviews include Zillow/Trulia, Realtor.com, RealSatisfied, Zap, Yelp, LinkedIn, Google, and Facebook. Citations can = SEO. Local directories, or citations are 3rd party sites such as Google My Business, Facebook, Yelp and YP. For SEO purposes, it is important to consistently display agent information and maintain a strong network of links between your website and 3rd party sites. Whichever website you choose will receive the ‘SEO juice’ generated by citations. Amy recommended BrightLocal who, for a one-time fee, can link you to all of the citation sites. Maintain a social balance. Maintain a social balance on your website and social media channels by including a mix of community happenings/events, local news, company updates, market news, household tips, and listings. The more local knowledge and news you can share, the better. Remember, your community is local, your listings are local, YOU are local. Amy also emphasized the importance of establishing a core site — that is one site where you send all your SEO. This could come from community data pages, blogs, directories, profiles, community news, reviews, listings, and lifestyle posts. If you start doing this on a regular basis, your link network will continue to grow exponentially and, in return, generate new leads, resources, and business. For more tips and advice, follow Amy on Twitter @amychorew and watch the full webinar here. A day in the life of a real estate agent can be chaotic, unpredictable and stressful. You spend most of your days showing or touring homes, but at the end of the day, your home is where you can escape it all. If you still think there is something missing in your living space to make it a real home, keep reading. You would be surprised how easy it is to turn a residence into an oasis of relaxation, simply by changing a few things in your daily routine or paying closer attention to the design of your interior. Like with an exercise, a cooldown is necessary after an intense day. After coming in through the door, maybe you decide to make yourself a well-deserved snack, or spend a few relaxing minutes in front of the TV, or turn on the computer to watch lighthearted videos. Consider switching this up for some alone time, where you can let your rushing thoughts settle down. Choose a quiet, almost meditative room to sit down, focus on slow, deep breathing, and let your body relax. Also, eliminating the use of electronic devices an hour before bed can help increase the quality of your sleep. One of the best ways to freshen up your living space is to let in some daylight and the outside air. Unless you live in an extremely polluted area, chances are that simply opening a window will greatly help with your relaxation. However, if you are unable to do this, there are other options. Buy an air freshener, turn up the AC; get some new and easy-on-the-eyes wallpapers, curtains or roller blinds. Shopping through your computer has made the search for these items even more accessible and stress-free. Make this interior redesign into a fun project that you can share with your loved ones. If you browsed any lifestyle blogs in the past year or two, you might have noticed the increased popularity of houseplants. Succulents, orchids, even fruits, and vegetables are being grown indoors, both for their functionality and decor. Try and grow your own oasis, even if you don’t have a garden because it is a proven stress-relief treatment. There are plenty of websites where you can read on various plant families, other user’s reviews and decide which plants will suit you best, based on your daily schedule and the level of attention they demand. Undoubtedly, one of the biggest problems of every household is the clutter that comes with the chaos of everyday life. Quite often, people don’t have the time to clean up on workdays, due to being overworked and exhausted. However, this can actually help them recuperate. To come home, close the blinds, go online and spend the rest of the evening hypnotized in front of a monitor is hardly going to clear your head. Setting aside a couple of minutes every day, simply to make your bed or clean out your desk can do wonders for your mental state. It’s as simple as that – color. There is no need to get into an elaborate explanation on how colors affect the mood; there are entire case studies are based on this topic. But what we can emphasize is to use color everywhere, not just on walls – on furniture, picture frames, carpets, bookshelves, lamps, and so on. Unobtrusive, subtle shades of blue and purple have been proven to have a calming effect. Use yellow to simulate sunlight and bring warmth to a room. Green is the color of nature, so you might want to utilize it in places with wooden furniture. Natural light – if you’re lucky to have a window on the sunny side, throw aside the curtains; adjust your shutters to create unique mood lighting. There are countless stores that offer a wide array of window-related products, online. Blinds and shutters of different colors and designs will certainly freshen up your room. Artificial light – this is where you can get especially creative. Install a light dimmer in the rooms of your choice, or try out light bulbs of different colors. Orange and pink are the usual choices over the intrusive white or yellow. Candles are also a welcome option, with a scented bonus! Selling or searching for a new home can be stressful for your clients as well. Don’t hesitate to share how they can make their new or current home a relaxing, comfortable place. Perhaps the best thing you can do is take a page from your own book, your own experience. What made your childhood home feel like a home? Was it the smells, the sights, the people, or perhaps all of those things together? Take some time to reflect on what you need in a home. And then find the best way to ensure it becomes a truly relaxing place – a safe haven where the chaos of the outside world disappears. BIO: Aside from primary area of interest and expertise in business consulting with Supercheap Storage Central Coast, Ian Pearson could be tagged also as a passionate sports fan, nature and photography enthusiast, always trying to keep up to date with tech innovations and development.